We have started our unit on measurement and making conversions and comparisons in the metric and customary systems. Students have added vocabulary notes to the math journals. They should be studying the measurements and conversions as we continue to add information to the journals. There is a lot of memorization which goes with this unit. Please encourage them to study the conversion rates at home to help them be prepared for class. This week we will be working with making conversions and comparisons with the customary system of measurement. The conversion rates can be seen below. There will be a customary conversion and comparison quiz on Thursday, February 7. 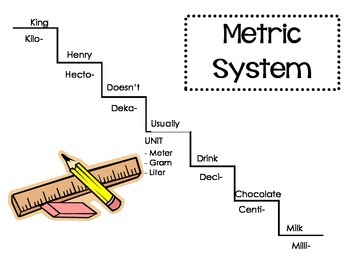 Next week we will be making conversions and comparisons using the metric system. We are working on a unit on Tone and Mood in fiction literature this week. Students are working to identify the tone of the author and the mood of a book or passage based on text evidence and how they feel while reading. Students should be reading a book of their choice every day during school and every evening at home. This should be the biography book for their project this week. They should have taken their 3rd AR test or written letters by Friday, February 15. We are working on Wordly Wise Unit 12 this week. The test will be on Thursday, February 7. This week we will be continuing to work with the Greek and Latin root words in class. We will be writing a narrative response to a Greek Myth as well.